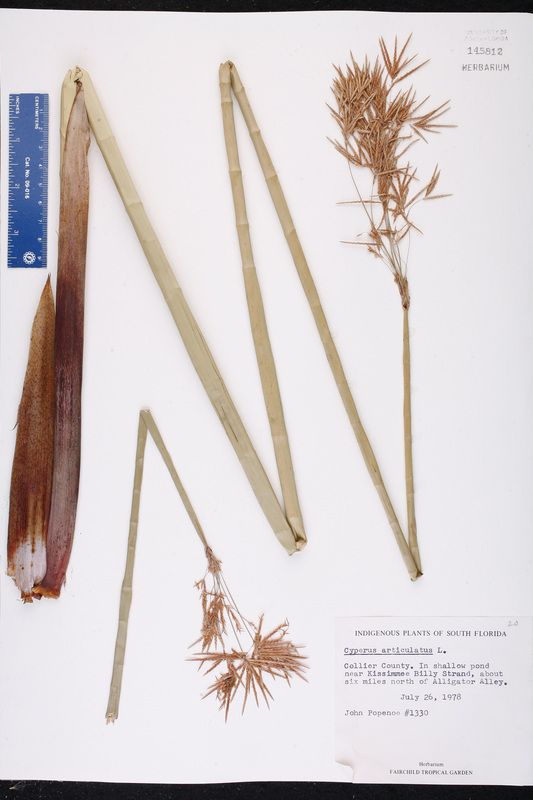 Citation CYPERUS ARTICULATUS Linnaeus, Sp. Pl. 44. 1753. Type: JAMAICA: Without data (lectotype: Sloane, Voy. Jamaica 1: t. 81(1). 1707). Lectotypified by G. C. Tucker, Syst. Bot. Monogr. 2: 42. 1983. Chlorocyperus articulatus Chlorocyperus articulatus (Linnaeus) Rikli, Jahrb. Wiss. Bot. 27: 563. 1895. 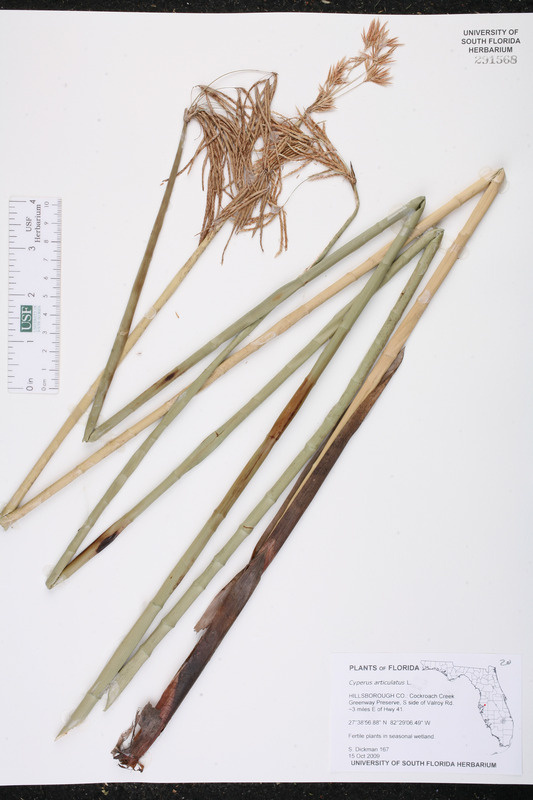 BASIONYM: Cyperus articulatus Linnaeus 1753. 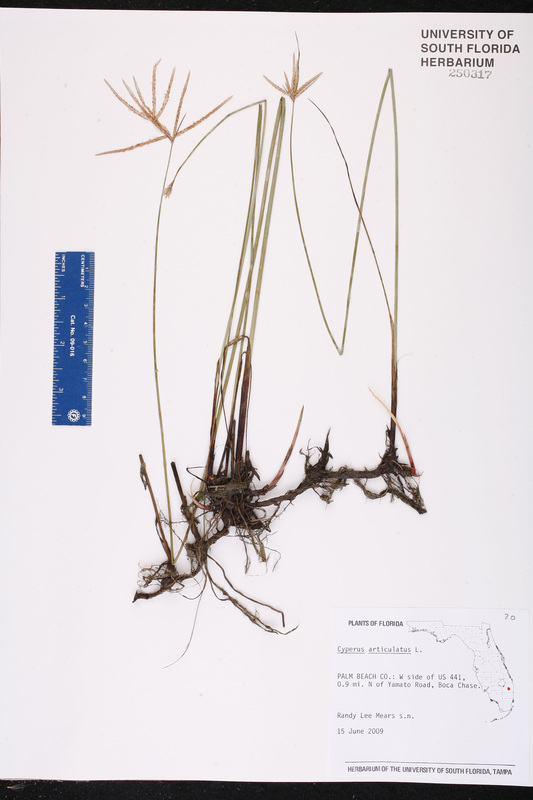 Cyperus articulatus var. multiflorus Cyperus articulatus Linnaeus, var. multiflorus Kükenthal, in Engler, Pflanzenr. 4(Heft 101): 79. 1935. 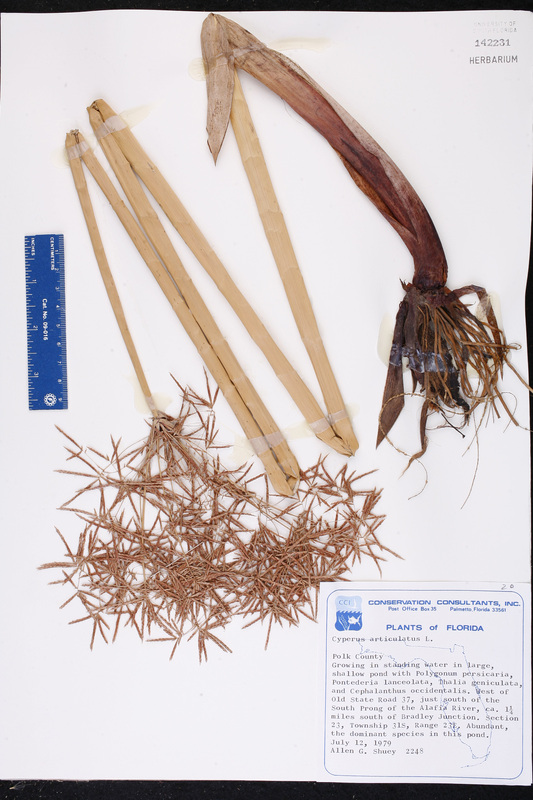 TYPE: FLORIDA: Lake Co.: Near Eustis, s.d., Nash 1701 (holotype: B? ; isotypes: CONN, MICH, NY). Cyperus articulatus forma longispiculosus Cyperus articulatus Linnaeus, forma longispiculosus Kükenthal, Repert. Spec. Nov. Regni Veg. 26: 250. 1929. 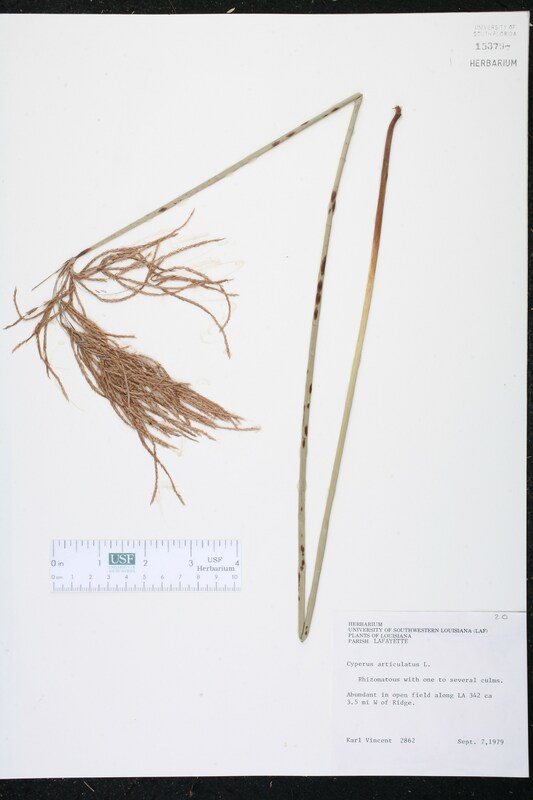 Cyperus articulatus var. conglomeratus Cyperus articulatus Linnaeus, var. conglomeratus Britton, Bull. Torrey Bot. Club 13: 210. 1886. TYPE: TEXAS: Valley of the lower Rio Grande, 1879-1883, Buckley s.n. (holortype: NY). 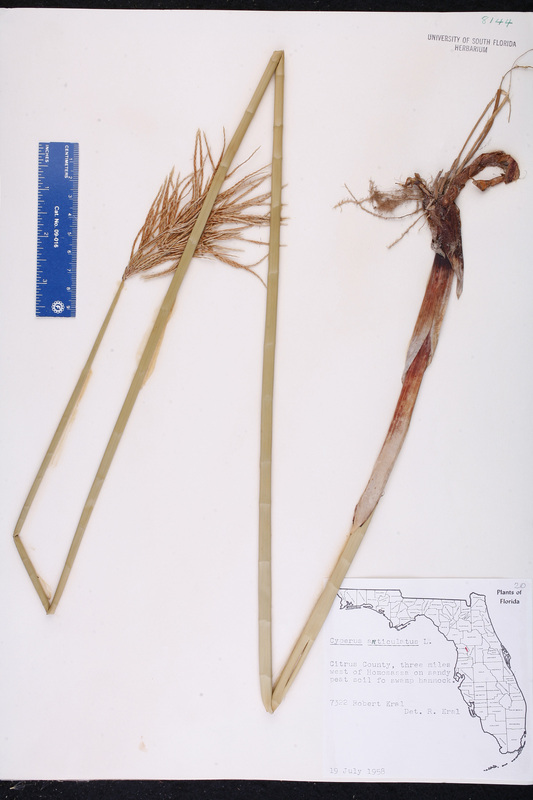 Cyperus articulatus var. 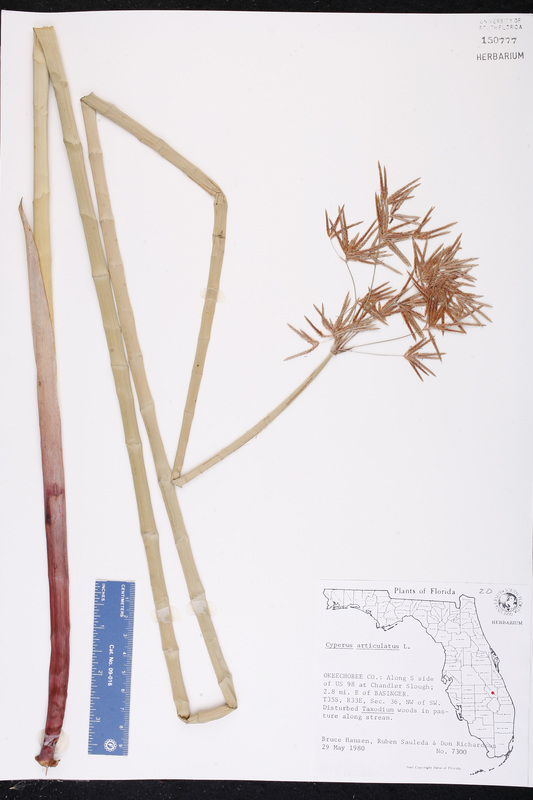 erythrostachys Cyperus articulatus Linnaeus, var. erythrostachys Graebner, Repert. Spec. Nov. Regni Veg. 16: 25. 1919. 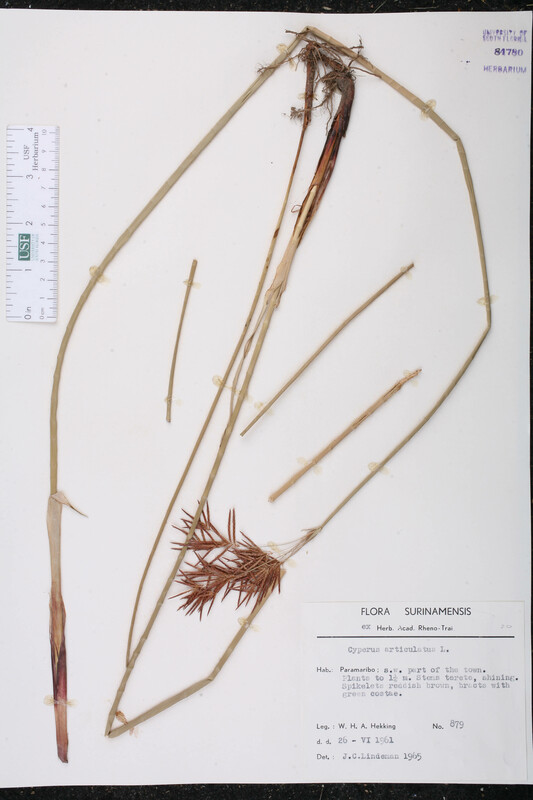 Cyperus articulatus var. 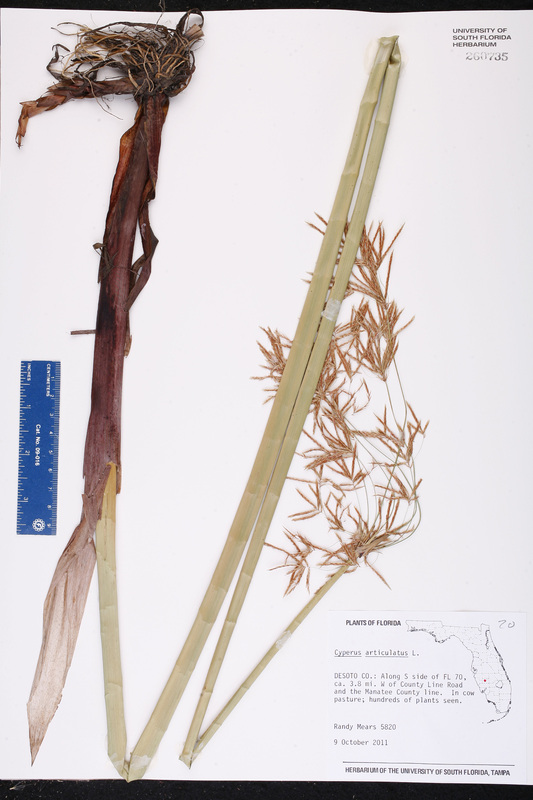 fistulosus Cyperus articulatus Linnaeus, var. fistulosus Kükenthal, in Engler, Pflanzenr. 4(Heft 101): 79. 1935. 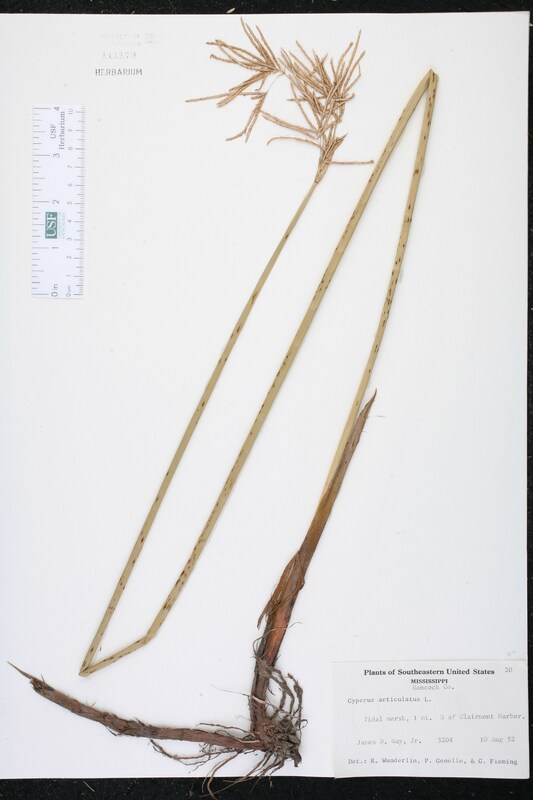 Cyperus articulatus var. nodosus Cyperus articulatus Linnaeus, var. nodosus (Humboldt & Bonpland ex Willdenow) Kükenthal, in Engler, Pflanzenr. 4(Heft 101): 79. 1936. 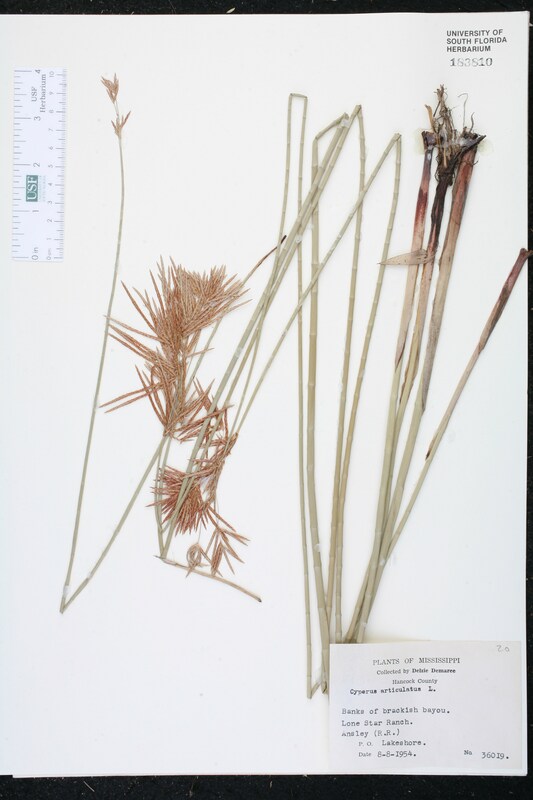 BASIONYM: Cyperus nodosus Willdenow 1809. 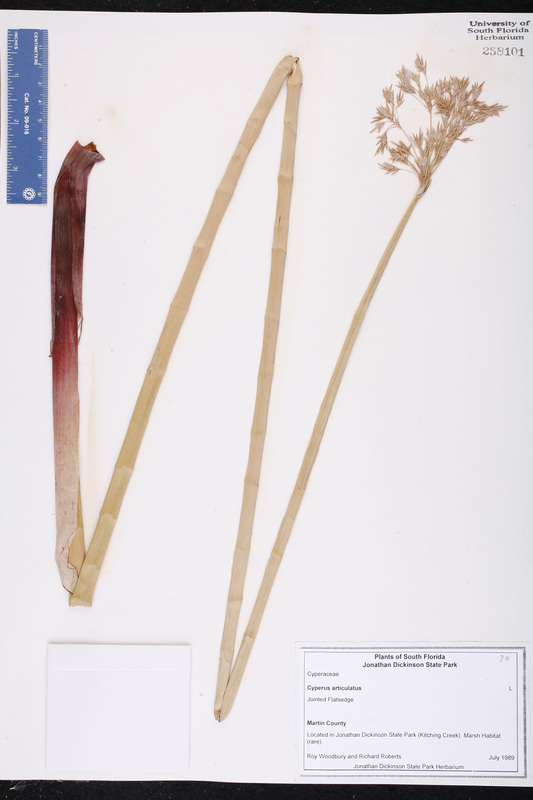 Cyperus cordobensis Cyperus cordobensis (Palla) Hicken, Darwiniana 1: 112. 1924. 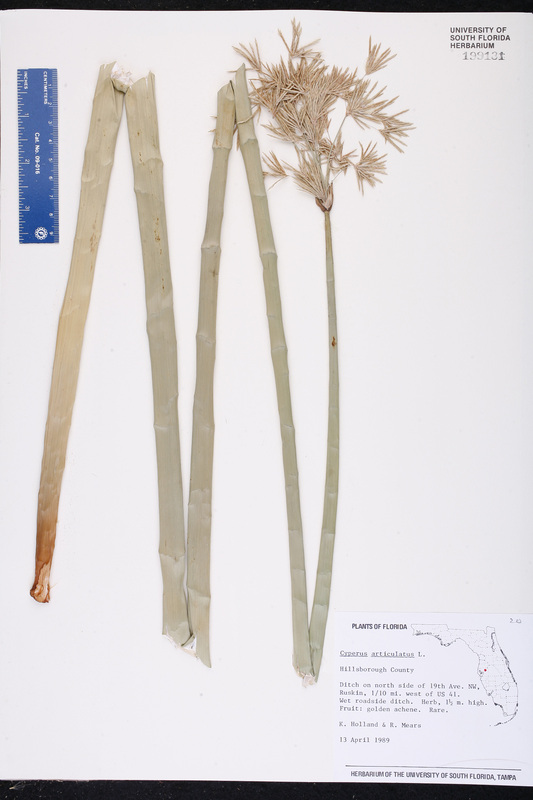 BASIONYM: Chlorocyperus cordobensis Palla 1903. Cyperus corymbosus Cyperus corymbosus Rottbøll, Descr. Pl. Rar. 19. 1772. TYPE: SURINAM: Without data, Rolander s.n. (holotype: C). 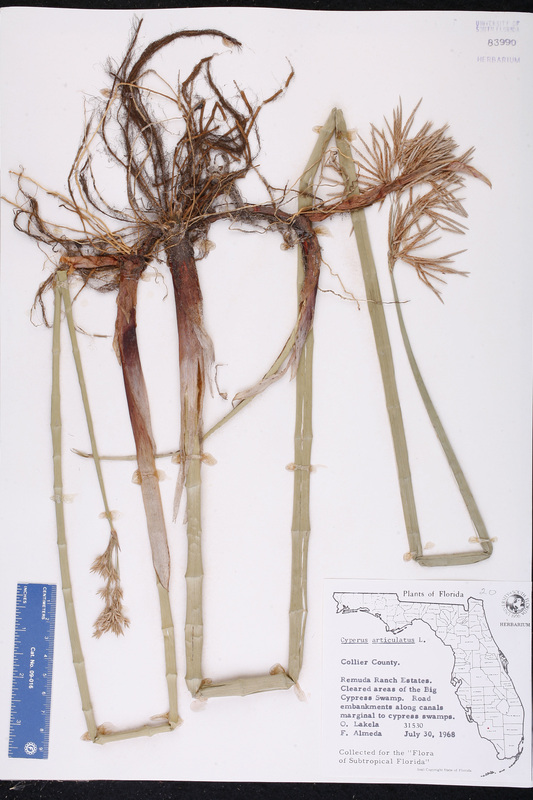 Cyperus corymbosus var. brevispiculatus Cyperus corymbosus Rottbøll, var. brevispiculatus (Kuntze) Kükenthal, in Engler, Pflanzenr. 4(Heft 101): 82. 1936. 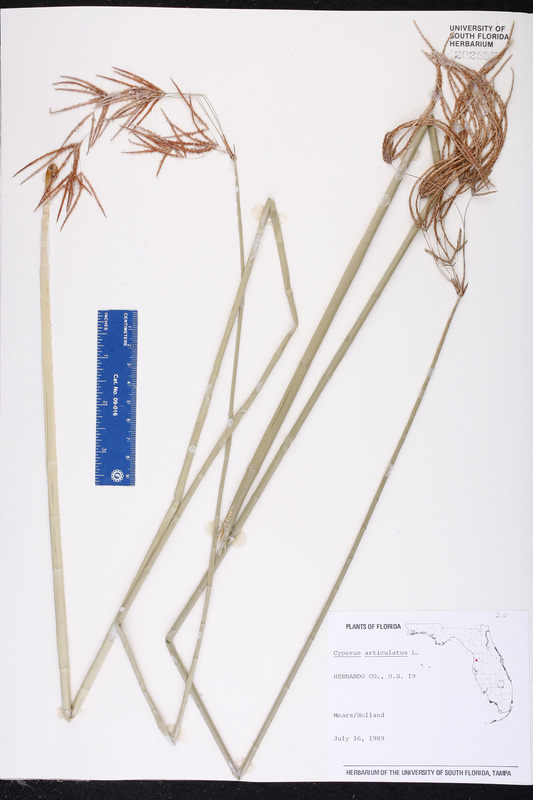 BASIONYM: Cyperus enodis Boeckeler, var. brevispiculatus Kuntze 1891. Cyperus corymbosus var. longispiculatus Cyperus corymbosus Rottbøll, var. longispiculatus (Kuntze) Kükenthal, in Engler, Pflanzenr. 4(Heft 101): 82. 1936. 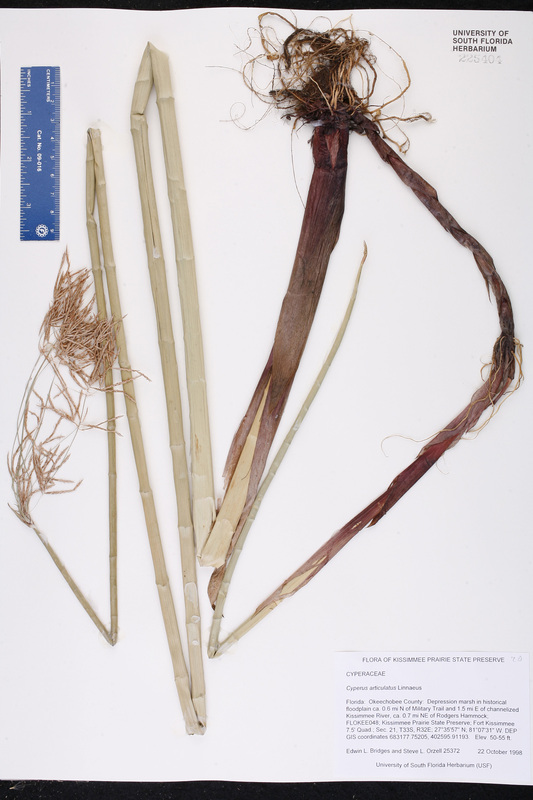 BASIONYM: Cyperus enodis Boeckeler, var. longispiculatus Kuntze 1891. 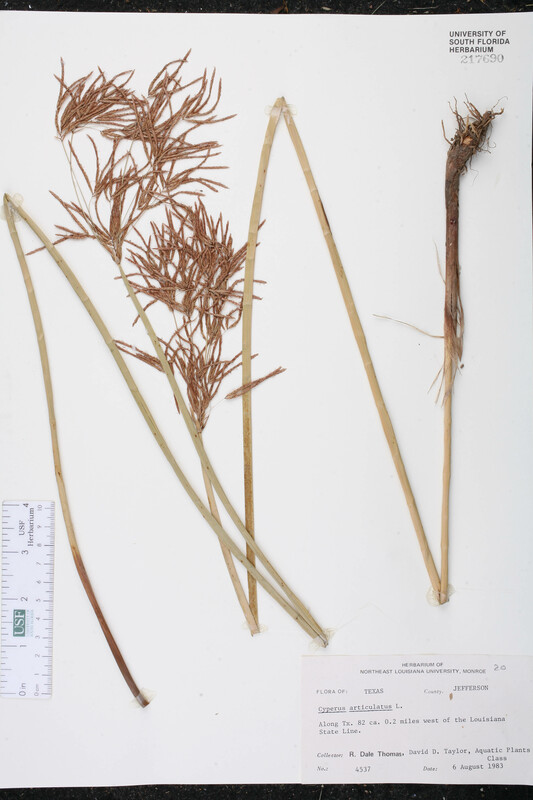 Cyperus corymbosus var. subnodosus Cyperus corymbosus Rottbøll, var. subnodosus (Nees von Esenbeck & Meyen) Kükenthal, Repert. Spec. Nov. Regni Veg. 23: 185. 1926. 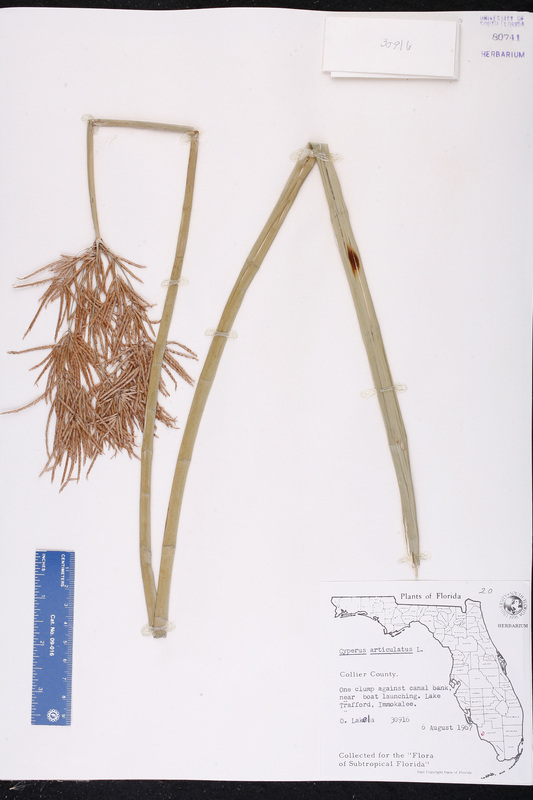 BASIONYM: Cyperus subnodosus Nees von Esenbeck & Meyen 1842. Cyperus diphyllus Cyperus diphyllus Retzius, Observ. Bot. 8: 11. 1788. 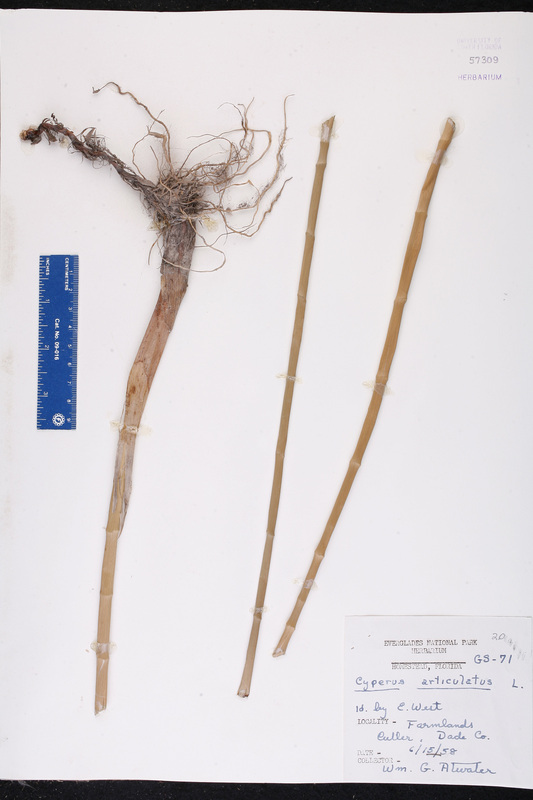 Cyperus diphyllus var. triangularis Cyperus diphyllus Retzius, var. triangularis Boeckeler, Linnaea 36: 273. 1870, nom. inadmiss. 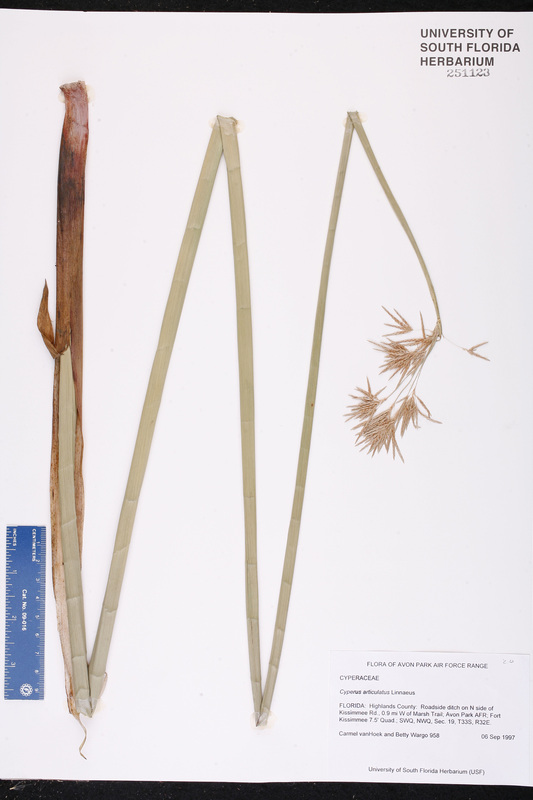 BASIONYM: Cyperus diphyllus Retzius 1788. 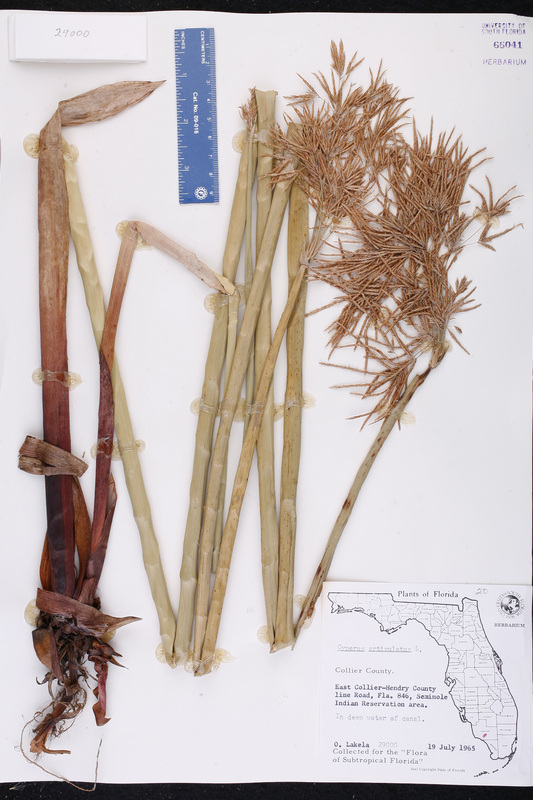 Cyperus enodis forma ferrugineus Cyperus enodis Boeckeler, forma ferrugineus Kuntze, Revis. Gen. Pl. 2: 749. 1891. 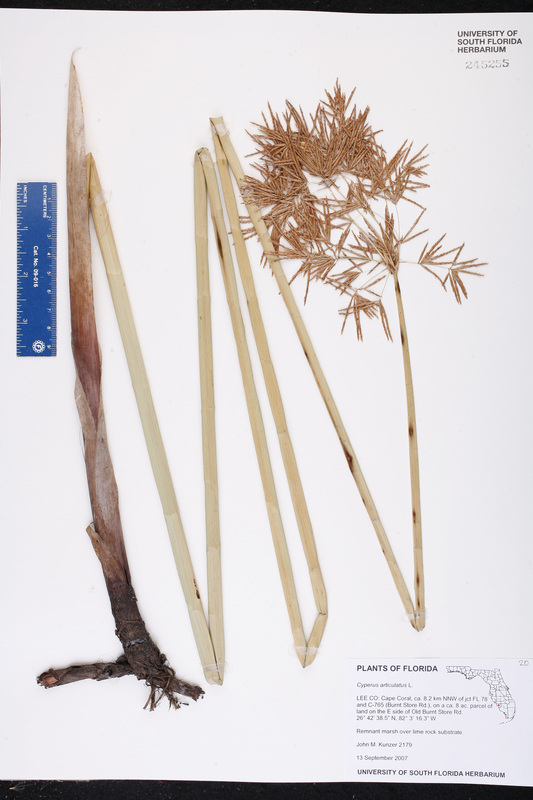 Cyperus enodis forma fuscus Cyperus enodis Boeckeler, forma fuscus Kuntze, Revis. Gen. Pl. 2: 749. 1891. 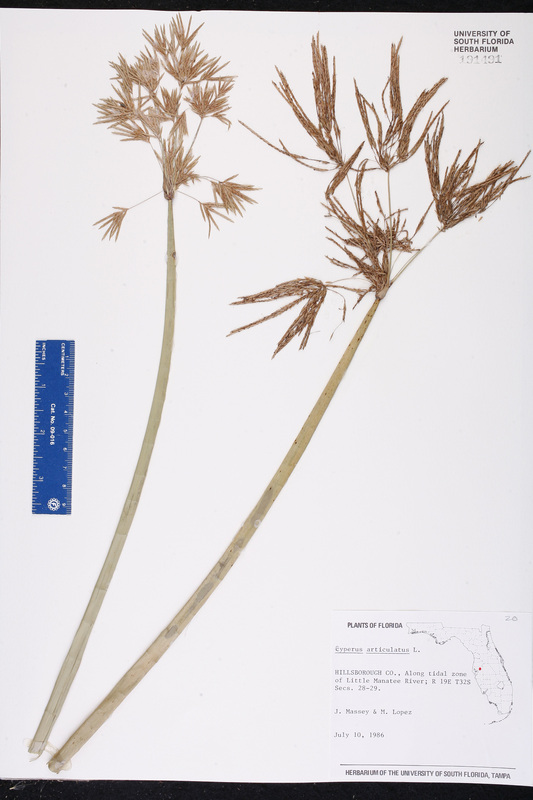 Cyperus enodis forma griseus Cyperus enodis Boeckeler, forma griseus Kuntze, Revis. Gen. Pl. 2: 749. 1891. Cyperus enodis var. brevispiculatus Cyperus enodis Boeckeler, var. brevispiculatus Kuntze, Revis. Gen. Pl. 2: 749. 1891. Cyperus enodis var. longispiculatus Cyperus enodis Boeckeler, var. longispiculatus Kuntze, Revis. Gen. Pl. 2: 749. 1891. Cyperus gula-methhi Cyperus gula-methhi Schultes, Mant. 2: 125. 1824. 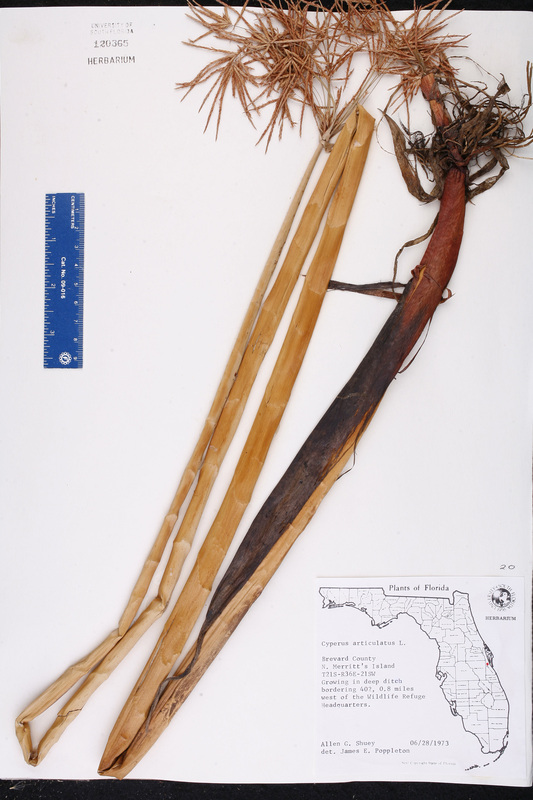 BASIONYM: Cyperus nudus Roxburgh 1820, non Kunth 1816. Cyperus gymnos Cyperus gymnos Schultes, Mant. 2: 97. 1824. Cyperus interceptus Cyperus interceptus Steudel, Syn. Pl. Glumac. 2: 31. 1854. 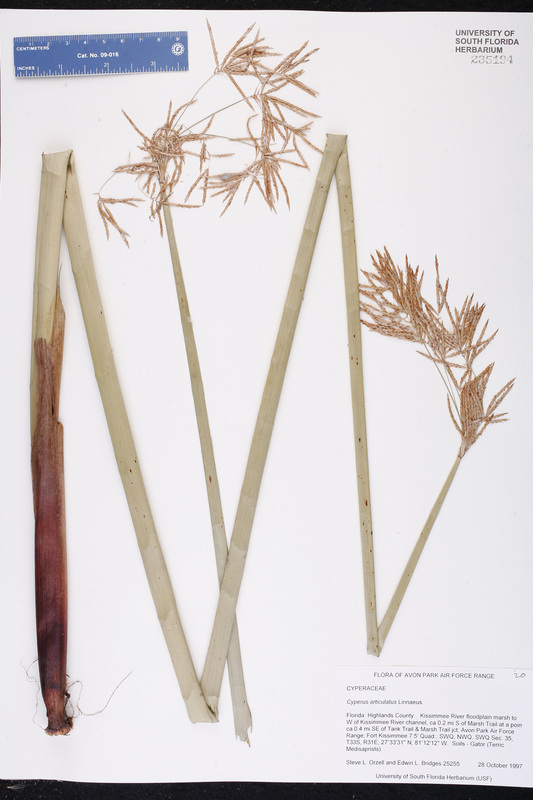 Cyperus koenigii Cyperus koenigii Vahl, Enum. Pl. 2: 302. 1805. 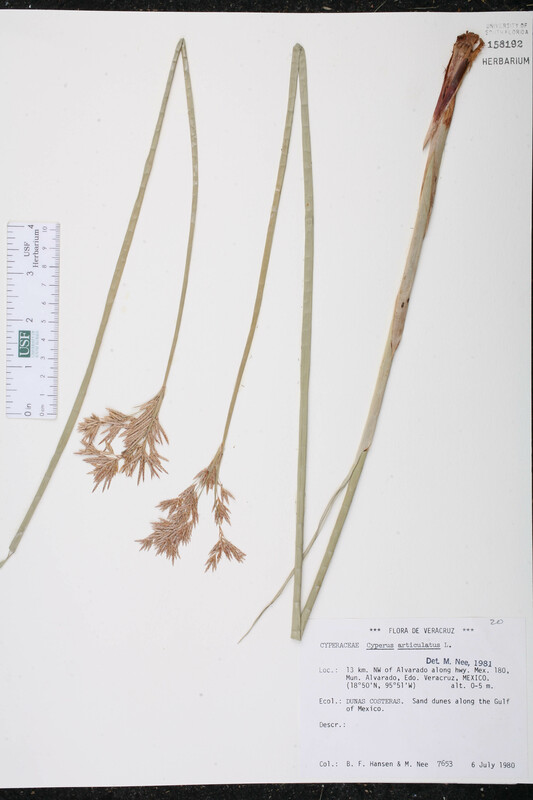 Cyperus longus var. 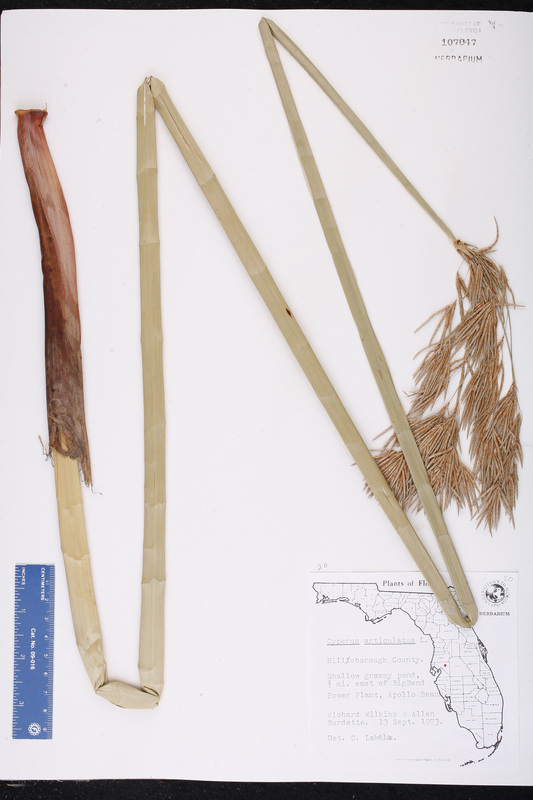 pallescens Cyperus longus Linnaeus, var. pallescens (Desfontaines) Cosson & Durieu de Maisonneuve, Expl. Sci. Algérie, Bot. II. 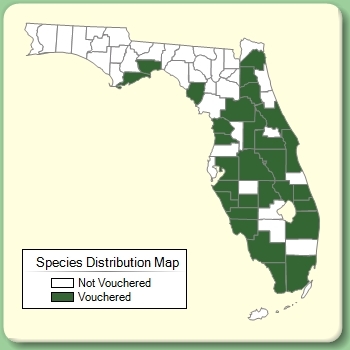 2249. 1855. 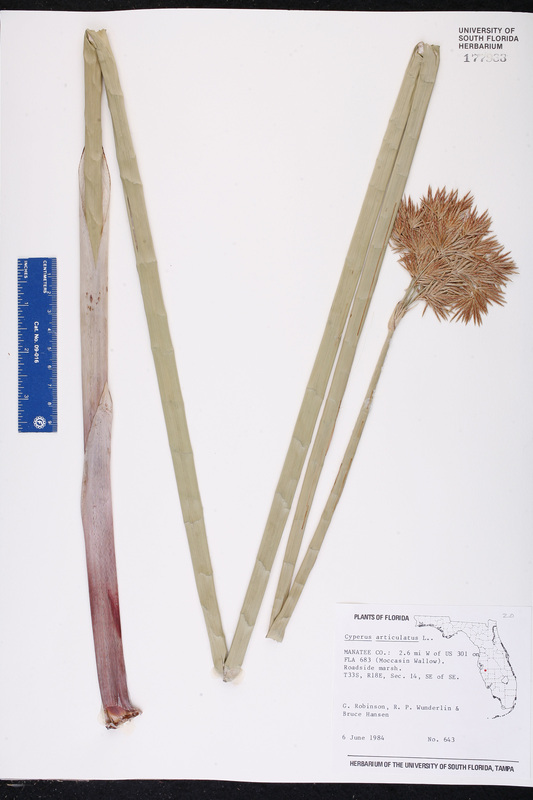 BASIONYM: Cyperus pallescens Desfontaines 1798. Cyperus nodosus var. 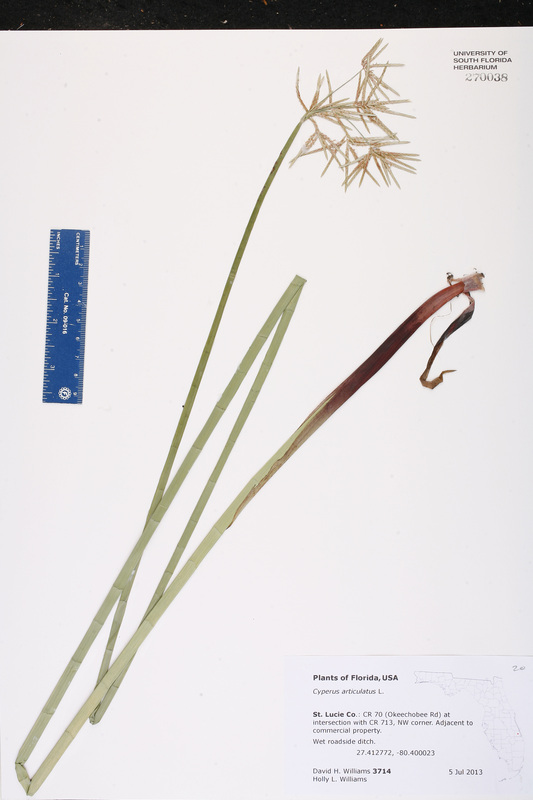 aphyllus Cyperus nodosus Willdenow, var. aphyllus Boeckeler, Linnaea 36: 275. 1870, nom. inadmiss. 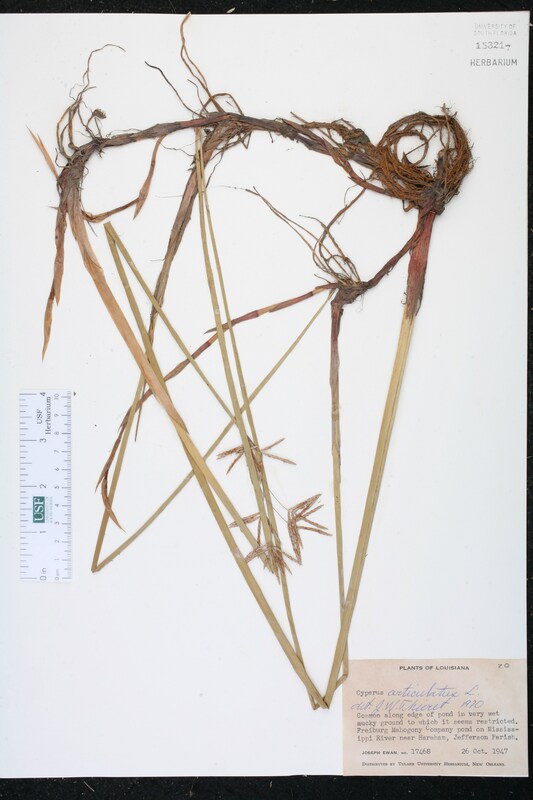 BASIONYM: Cyperus nodosus Willdenow 1809. 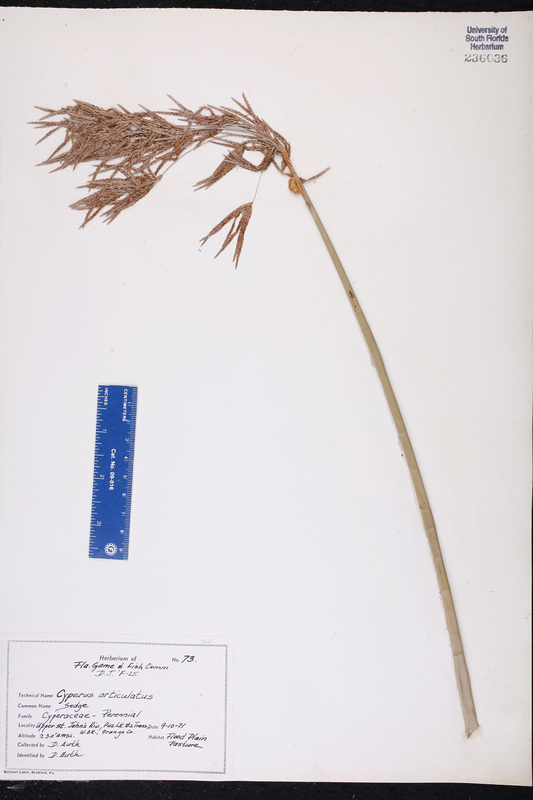 Cyperus nodosus var. 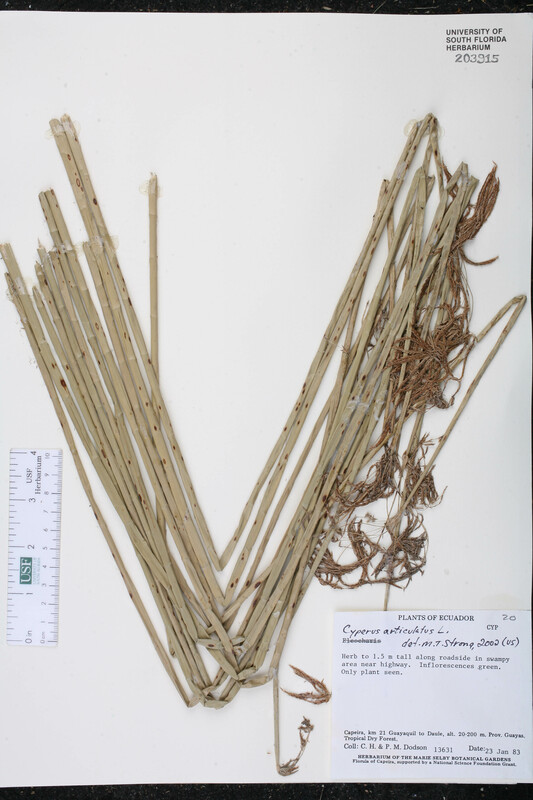 subnodosus Cyperus nodosus Willdenow, var. subnososus (Nees von Esenbeck & Meyen) Boeckeler, Linnaea 36: 276. 1870. 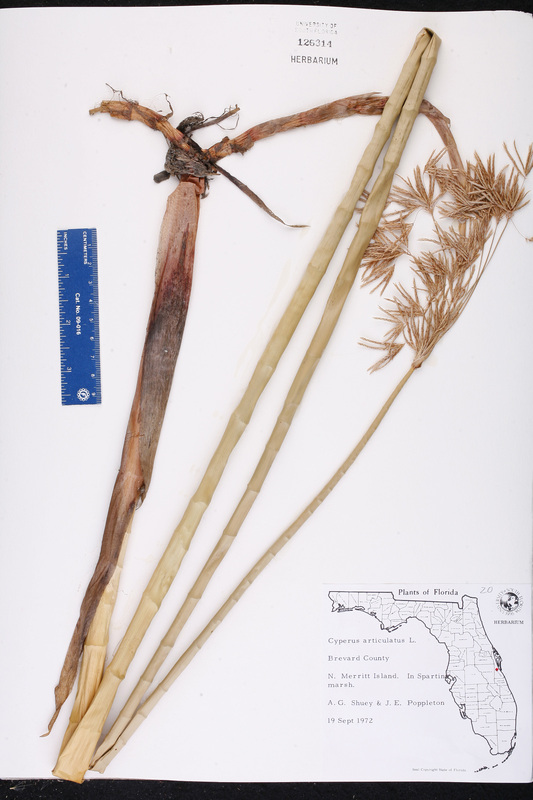 BASIONYM: Cyperus subnodosus Nees von Esenbeck & Meyen 1842. 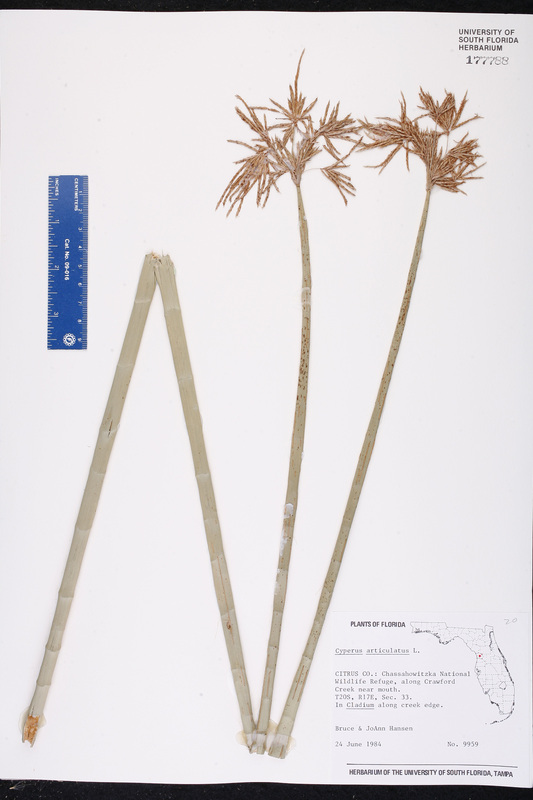 Cyperus pallescens Cyperus pallescens Desfontaines, Fl. Atlant. 1: 45, t. 9. 1798. Cyperus roestelii Cyperus roestelii Kunth, Enum. Pl. 2: 58. 1837. Cyperus tenuicomus Cyperus tenuicomus Miquel, Linnaea 19: 223. 1846. USA Florida Hillsborough Co. 13 Apr 1989 K. Holland s.n. USA Florida Brevard Co. 19 Sep 1972 A.G. Shuey s.n. USA Florida Palm Beach Co. 15 Jun 2009 R. Mears s.n. USA Florida Hillsborough Co. 13 Sep 1973 R. Wilkins s.n. USA Florida Hernando Co. 16 Jul 1989 R. Mears s.n.